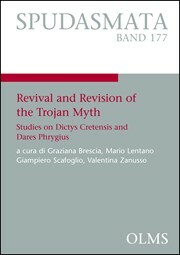 Graziana Brescia, Mario Lentano, Giampiero Scafoglio et Valentina Zanusso, Revival and Revision of the Trojan Myth. Studies on Dictys and Dares, Hildesheim-New York, 2018. The ‘alternative' rewritings of the Trojan myth by Dictys and Dares are among the most interesting and mysterious works of Late Antiquity: yet it is only recently that they have started getting due attention, and many issues about them still remain unsolved. This is one of the first books that relies on contributions by several scholars to comprehensively cover this subject in its various aspects, from the delicate question of (true or supposed) Greek models to cultural context, expected audience, intertextuality, structural patterns, narrative technique, themes, characters, aims, up to style and language. What emerges is a fuller and partly new view of the two works.